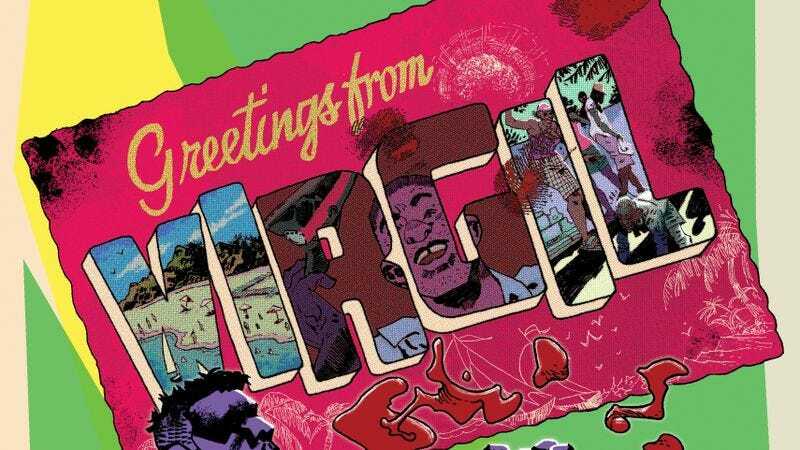 Two years ago, writer Steve Orlando launched a successful Kickstarter campaign to fund his graphic novel Virgil, a queersploitation revenge thriller in the vein of Shaft and Cleopatra Jones starring a closeted Jamaican cop whose world is shattered when he is outed and his boyfriend is abducted. Virgil embarks on a mission to make his enemies pay and rescue his lover, igniting a fiery hunger for vengeance that burns hotter as he gets more blood on his hands. Orlando has become a rising star in comics with his work on Image’s Undertow and DC’s Midnighter, and next week, Image releases Virgil for all the people that missed the Kickstarter. It’s a story as suspenseful and thrilling as it is heartfelt and tender, and this preview highlights that tonal balancing act as Virgil jumps into action and faces off against the police brethren that betrayed him. Artist J.D. Faith and colorist Chris Beckett join Orlando to bring Virgil’s painful journey to the page, and their bold artwork dramatically ramps up the intensity of the narrative. Faith’s thick inks, detailed environments, and nuanced characterizations ground the story in reality, but Beckett’s vibrant, expressive coloring takes a more figurative approach that reflects Virgil’s emotional state. A memory of Virgil being comforted by his boyfriend Ervan is colored with a romantic lavender, which is replaced by a tense contrast of burning orange and icy blue when present-day Virgil jumps into action. It’s a striking graphic novel, and the artwork makes Orlando’s script hit even harder.